With the Mars/2DI/4GD3 ASUS presents the fastet graphics card for gaming and enthusiasts. Therefore they had to design a completely new cooler fitting the design we already know from the GTX 295. This new cooler also has to be able to cope with much more dissipation power from the because the GPU are clocked way higher than the on a GTX 295. Furthermore the card is limited to 1'000 pieces worldwide which will make this piece of hardware exclusive from the very beginning. 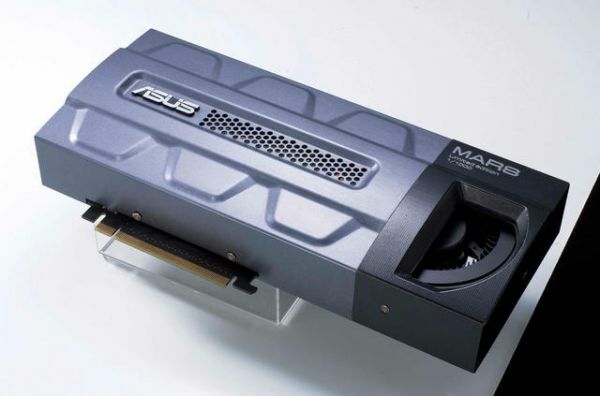 ASUS equipped the Mars/2DI/4GD3 with 4 GByte GDDR3 memory which is 2 GByte per GTX 285 GPU. The 0.77 ns memory can be clocked up to 1'300 MHz. Even with the memory ASUS pushes the borders. Therefore the Mars is the first card which comes with 2 GByte per GPU. A consequence of putting two GTX 285 around one cooler is that ASUS had to modify their cooler for the Mars heavily. The dissipation power the two cards are able to generate are also much higher then everything that has been on the market before. But not only the cooling solution is different. ASUS also equipped the Mars with a digital twelve phase power design which makes a huge difference to the analog six phase power design you can find on a GTX 295.